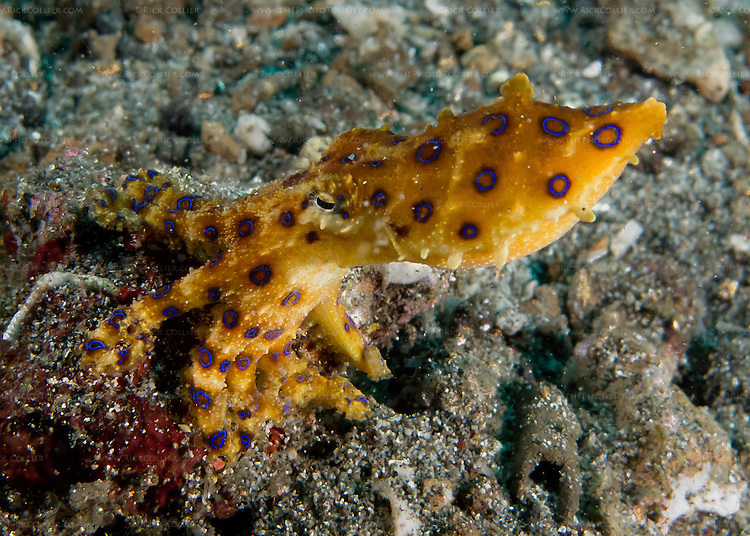 The blue ring octopus is among the most venomous creatures in the world; its bite is usually lethal even to a large adult. However, this little octopus is tiny -- no larger than man's thumb -- and not at all aggressive. It prefers to be unnoticed; if that fails, it will flee (though like many poisonous creatures, it usually does so in a relatively sedate manner). Like other species, this little octopus changes color to match its surroundings (or possibly reflect its emotional state). Normally brown or another nondescript color to blend in with its surroundings, the blue ring turns photogenically bright yellow with blue rings only when disturbed.